“Spray Falls” Michigan’s Pictured Rocks National Lakeshore, photo by Michigan Nut. Spray Falls is the remotest, and perhaps the most impressive of the several waterfalls in Pictured Rocks National Lakeshore. 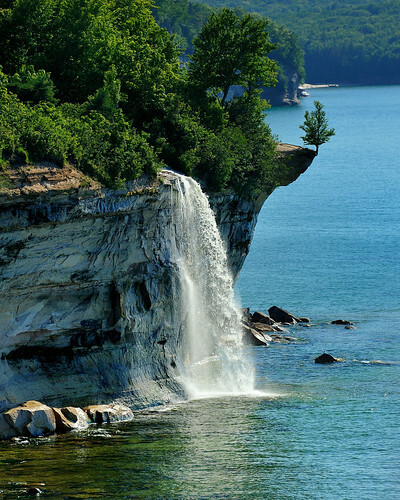 The 70′ waterfall plunges over the cliffs at Pictured Rocks and lands directly in Lake Superior. The Lakeshore Trail passes right over the top of the falls, and you can get right to the brink of the falls. Check this out on black and in John’s Michigan Waterfalls slideshow. More of the Pictured Rocks on Michigan in Pictures! I love living in Munising, MI. We get to see all the beauty of Lk. Superior every day!